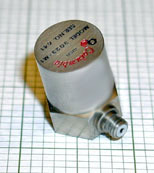 The Model 3023M5 Piezoelectric Accelerometer exhibits a transfer sensitivity of 10 picoCoulombs/g and operation to +400 degrees C. The moderate sensitivity and wide frequency response provides a device well suited for a broad range of vibration monitoring and analysis applications in the most demanding environments. The internal construction of the piezoelectric seismic system ensures that the units have no discernible spurious response to mounting torque, body strains, cable vibration, cable whip, pressure variations and most heat transients. The sensor's Alloy C-276 housing provides an environmentally rugged unit, and the hermetically-sealed welded construction offers protection against high humidity environments. Signal ground is connected to the outer case of the unit. This accelerometer features a 10-32 side connector and is provided with a 10" low-noise coaxial cable. Consult the factory for customized versions of this sensor. 10,000 M Ohm Min, 50 VDC Test 25 M Ohm Min.